２０１４年 博士（工学）： 東京大学大学院工学系研究科, 詳細ページ, 東京大学学術機関リポジトリ, paper(.pdf), slideshare, slide(.pdf). Research Gate, Google Scholar, Research Map. 博士論文 [東京大学大学院工学系研究科 2014年]： 人工市場シミュレーションを用いた金融市場の規制・制度の分析., 詳細ページ, 東京大学学術機関リポジトリ, paper(.pdf), slideshare, slide(.pdf). 修士論文 [東京大学大学院理学系研究科 2002年]： New wave heating process of heavy ions in multi-component plasmas, 研究背景の一般向け解説, その.pdf版, paper(.pdf). - Mizuta, T., Horie, S., Mechanism by which active funds make market efficient investigated with agent-based model, Evolutionary and Institutional Economics Review, 2018, Complimentary shared FULL Text. - Nozaki, A., Mizuta, T., Yagi, I., A Study on the Market Impact of the Rule for Investment Diversification at the Time of a Market Crash using a Multi-Agent Simulation, IEICE(the Institute of Electronics, Information and Communication Engineers) TRANSACTIONS on Information and Systems, Vol. E100.D, Issue 12, pp.2878-2887, 2017. - Yagi, I., Nozaki, A., Mizuta, T., Investigation of the rule for investment diversification at the time of a market crash using an artificial market simulation, Evolutionary and Institutional Economics Review, Vol. 14, Issue 2, pp.451-465, 2017. - 草田裕紀, 水田孝信, 早川聡, 和泉潔, 保有資産を考慮したマーケットメイク戦略が取引所間競争に与える影 響:人工市場アプローチによる分析, 人工知能学会論文誌, Vol. 30, No. 5, pp.675-682, 2015. - Mizuta, T., Kosugi, S., Kusumoto, T., Matsumoto, T., Izumi, K., Yagi, I., Yoshimura, S., Effects of Price Regulations and Dark Pools on Financial Market Stability: An Investigation by Multi-Agent Simulations, Intelligent Systems in Accounting, Finance and Management, Vol. 23, Issue 1-2, pp.97-120, 2016 (first published online: 2015). - 水田孝信, 和泉潔, 八木勲, 吉村忍, 人工市場を用いた値幅制限・空売り規制・アップティックルールの検証と最適な制度の設計, 電気学会論文誌 論文誌C, Vol. 133, No.9, pp.1694-1700, 2013. -->(英訳版) Mizuta, T., Izumi, K., Yagi, I., Yoshimura, S., Investigation of Price Variation Limits, Short Selling Regulation, and Uptick Rules and Their Optimal Design by Artificial Market Simulations, Electronics and Communications in Japan, Vol.98, Issue 7, pp.13-21, July, 2015. - Mizuta, T., Izumi, K., Yagi, I., Yoshimura, S., Design of Financial Market Regulations against Large PriceFluctuations using by Artificial Market Simulations, Journal of Mathematical Finance, Scientific Research Publishing, Vol.3, No. 2A, pp.15-22, 2013. - Wang, C., Izumi, K., Mizuta, T., and Yoshimura, S., Investigating the Impact of Trading Frequencies of Market Makers: a Multi-agent Simulation Approach, SICE Journal of Control, Measurement, and System Integration, Vol.6, No. 3, pp.216-220, 2013. - 曹治平, 古幡征史，水田孝信, 売買コストを考慮した市場急変に対応する日本株式運用モデル, ジャフィー・ジャーナル(日本金融・証券計量・工学学会和文ジャーナル), Vol. 12, 2013. - 水田孝信, 八木勲, 和泉潔, 現実の価格決定メカニズムを考慮した人工市場の設定評価手法の開発, 人工知能学会論文誌, Vol. 27, No. 6, pp.320-327, 2012. - 八木勲, 水田孝信, 和泉潔, 人工市場を用いた市場暴落後における反発メカニズムの分析, 情報処理学会論文誌, Vol. 53, No. 11, pp.2388-2398, 2012. - Furuhata, M., Mizuta T., So J., Paired Evaluators Method to Track Concept Drift: An Application in Finance, Advances in Chance Discovery, Studies in Computational Intelligence, 2013, Volume 423, pp.127-141, 2013. - 八木勲, 水田孝信, 和泉潔, 人工市場を利用した空売り規制が与える株式市場への影響分析 , 人工知能学会論文誌, Vol. 26, No. 1, pp.208-216, 2011. - Yagi, I., Mizuta, T., Izumi, K., A Study on the Market Impact of Short-Selling Regulation Using Artificial Markets, ADVANCES IN PRACTICAL MULTI-AGENT SYSTEMS Studies in Computational Intelligence, Volume, Vol. 325, pp.217-231, 2011. - Yagi, I., Mizuta, T., Izumi, K., A Study on the Effectiveness of Short-selling Regulation using Artificial Markets, Evolutionary and Institutional Economics Review, Vol.7, No.1, pp.113-132, 2010. - 水田孝信, 小林悟, 加藤徳史, 下妻友成, 精密で複雑なクオンツファンドは優れているか？, 証券アナリストジャーナル, 10月号, pp.72-81, 2008. - Mizuta, T. and M. Hoshino, New Non-stochastic Acceleration in Multi-component Plasmas, COSPAR COLLOQUIA SERIES., Vol. 16, Frontiers in Magnetospheric Plasma Physics, pp.261-264, 2005. - Fujita, S., H. Nakata, M. Itonaga, A. Yoshikawa, and T. Mizuta, A numerical simulation of the Pi2 pulsations associated with the substorm current wedge, J. Geophys. Res., Vol. 107, No. A3, SMP 2, Mar, 2002. - Mizuta, T. and M. Hoshino, Preferential acceleration of heavy ions in multi-component plasmas, Geophys. Res. Lett., Vol. 28, No 16, pp.3099-3102, Aug 15, 2001. - Fujita, S., T. Mizuta, M. Itonaga, A. Yoshikawa, and H. Nakata, Propagation property of transient MHD impulses in the magnetosphere - ionosphere system: The 2D model of the Pi2 pulsation, Geophys. Res. Lett., Vol. 28, No 11, pp.2161-2164, Jun 1, 2001. - Mizuta, T., Effect of Increasing Horizontal Shareholding with Index Funds on Competition and Market Prices -- Investigation by Agent-Based Model --, The 5th International Conference on Behavioral, Economic, and Socio-Cultural Computing (BESC 2018), November 12 to 14, 2018, Kaohsiung, Taiwan, submitted-version paper(.pdf), slide(.pdf). 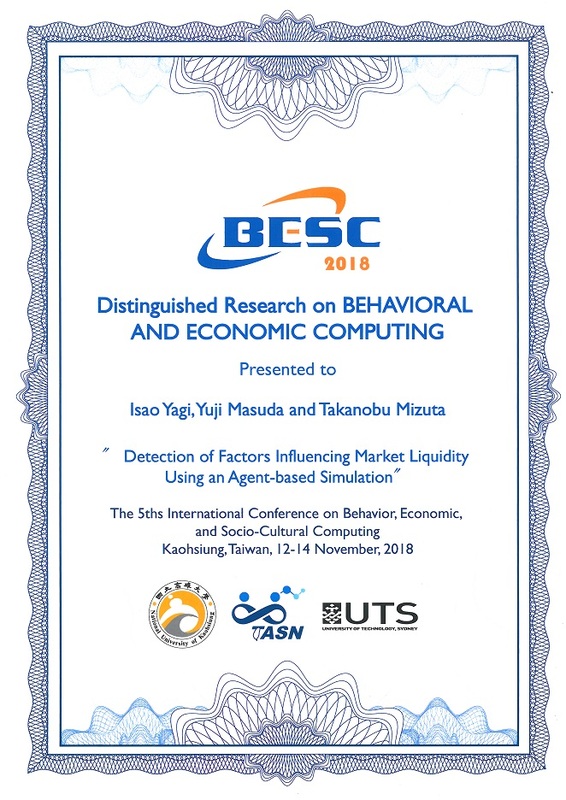 - Yagi, I., Masuda, Y., Mizuta, T., Detection of Factors Influencing Market Liquidity Using an Agent-based Simulation , The 5th International Conference on Behavioral, Economic, and Socio-Cultural Computing (BESC 2018), November 12 to 14, 2018, Kaohsiung, Taiwan. - Mizuta, T., Horie, S., Why do Active Funds that Trade Infrequently Make a Market more Efficient? - Investigation using Agent-Based Model, IEEE Symposium Series on Computational Intelligence, Computational Intelligence for Financial Engineering and Economics (CIFEr), November 27 to December 1, 2017, Honolulu, accepted-version paper(.pdf), slide(.pdf). - Mizuta, T., Noritake, Y., Hayakawa, S., Izumi, K., Affecting Market Efficiency by Increasing Speed of Order Matching Systems on Financial Exchanges -- Investigation using Agent Based Model, IEEE Symposium Series on Computational Intelligence, Computational Intelligence for Financial Engineering and Economics (CIFEr), December 6-9, 2016, Athens, slideshare, slide(.pdf). - Yagi, I., Mizuta, T., Analysis of the Impact of Leveraged ETF Rebalancing Trades on the Underlying Asset Market Using Artificial Market Simulation, 12th Artificial Economics Conference, September 20-21, 2016, Rome, slideshare, slide(.pdf), paper(.pdf). - Mizuta, T., Kosugi, S., Kusumoto, T., Matsumoto, W., Izumi, K., Yoshimura, S., Do Dark Pools Stabilize Markets and Reduce Market Impacts? 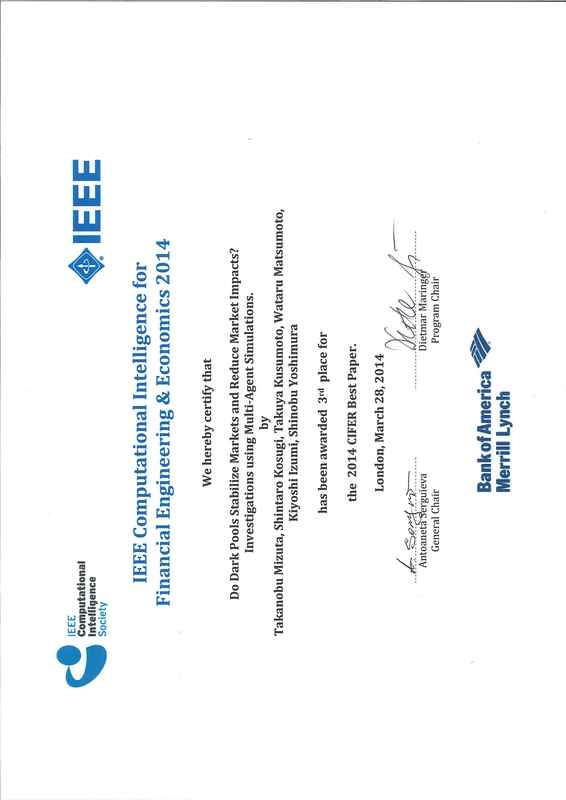 -- Investigations using Multi-Agent Simulations --, IEEE, Computational Intelligence for Financial Engineering and Economics (CIFEr), pp.71-76, March 27-28, 2014, London, slideshare, slide(.pdf). - Mizuta, T., Izumi, K., Yagi, I., Yoshimura, S., Regulations' Effectiveness for Market Turbulence by Large Erroneous Orders using Multi Agent Simulation, IEEE, Computational Intelligence for Financial Engineering and Economics (CIFEr), pp.138-143, March 27-28, 2014, London, slideshare, slide(.pdf). - Mizuta, T., Hayakawa, S., Izumi, K., Yoshimura, S., Simulation Study on Effects of Tick Size Difference in Stock Markets Competition, The 8th International Workshop on Agent-based Approach in Economic and Social Complex Systems (AESCS 2013), September 11-13, 2013, Tokyo, paper(.pdf), slide(slideshare), slide(.pdf). - Mizuta, T., Izumi, K., Yoshimura, S., Price Variation Limits and Financial Market Bubbles: Artificial Market Simulations with Agents' Learning Process, IEEE Symposium Series on Computational Intelligence, Computational Intelligence for Financial Engineering and Economics (CIFEr), pp.1-7, April 16-19, 2013, Singapore, slideshare, slide(.pdf). - Yagi, I., Mizuta, T., Izumi, K., A study on the Reversal Mechanism for Large Stock Price Declines Using Artificial Market, IEEE Computational Intelligence for Financial Engineering and Economics (CIFEr), pp. 1-7, March 29-30, 2012, New York. - Yagi, I., Mizuta, T., Izumi, K., A Study on the Effectiveness of Short-Selling Regulation in View of Regulation Period Using Artificial Markets, IEEE/ACIS 9th International Conference, Computer and Information Science (ICIS), pp. 169-174, August 18-20, 2010, Yamagata. - Furuhata, M., Mizuta T., So J., Paired Evaluators Method to Track Concept Drift: An Application for Hedge Funds Operations, 5th International Workshop on Chance Discovery (IWCD10) , December 14, 2010, Sydney. - COSPAR Colloquium Frontiers of Magnetospheric Plasma Physics, July 24-26, 2002, Kanagawa. - 益田裕司, 水田孝信, 八木勲, 人工市場を用いた金融市場流動性に影響を与える要因の調査, JPXワーキング・ペーパー, Vol. 29, 日本取引所グループ, 2019, 本文(.pdf), 要約版(.pdf). - 水田孝信, 株式とETFの裁定取引にかかるコストと流動性の関係 −人工市場によるシミュレーション分析−, JPXワーキング・ペーパー, Vol. 27, 日本取引所グループ, 2019, 本文(.pdf), 要約版(.pdf). - 水田孝信, 和泉潔, 人工市場シミュレーションを用いたバッチオークションの分析, JPXワーキング・ペーパー, Vol. 17, 日本取引所グループ, 2016, 本文(.pdf), 要約版(.pdf). -->(英訳版) Mizuta, T., Izumi, K., Investigation of Frequent Batch Auctions using Agent Based Model, JPX Working Paper , Vol. 17, Japan Exchange Group, 2016, Full Text(.pdf), Summary(.pdf). - 水田孝信, ARCHモデルのミクロ的基礎付けの試み, SSRN Working Paper Series, 2016, paper(.pdf). -->(英訳版) Mizuta, T., Micro-Foundation of ARCH Model, SSRN Working Paper Series, 2016, paper(.pdf). - Mizuta, T., A Brief Review of recent Artificial Market Simulation (Multi-Agent Simulation) Studies for Financial Market Regulations and/or Rules, SSRN Working Paper Series, 2016, paper(.pdf). - 水田孝信, 則武誉人, 早川聡，和泉潔, 人工市場シミュレーションを用いた取引システムの高速化が価格形成に与える影響の分析, JPXワーキング・ペーパー, Vol. 9, 日本取引所グループ, 2015, 本文(.pdf), 要約版(.pdf). -->(英訳版) Mizuta, T., Noritake, Y., Hayakawa, S., Izumi, K., Impacts of Speedup of Market System on Price Formations using Artificial Market Simulations, JPX Working Paper , Vol. 9, Japan Exchange Group, 2015, Full Text(.pdf), Summary(.pdf). - 草田裕紀, 水田孝信, 早川聡，和泉潔, 保有資産を考慮したマーケットメイク戦略が市場間競争に与える影響：人工市場アプローチによる分析, JPXワーキング・ペーパー, Vol. 8, 日本取引所グループ, 2015, 本文(.pdf), 要約版(.pdf). - 草田裕紀, 水田孝信, 早川聡，和泉潔, 吉村忍, 人工市場シミュレーションを用いたマーケットメイカーのスプレッドが市場出来高に与える影響の分析, JPXワーキング・ペーパー, Vol. 5, 日本取引所グループ, 2014, 本文(.pdf), 要約版(.pdf). - 水田孝信, 早川聡，和泉潔, 吉村忍, 人工市場シミュレーションを用いた取引市場間におけるティックサイズと取引量の関係性分析, JPXワーキング・ペーパー, Vol. 2, 日本取引所グループ, 2013, 本文(.pdf), 要約版(.pdf). -->(英訳版) Mizuta, T., Hayakawa, S., Izumi, K., Yoshimura, S., Investigation of Relationship between Tick Size and Trading Volume of Markets using Artificial Market Simulations, JPX Working Paper , Vol. 2, Japan Exchange Group, 2013, Full Text(.pdf), Summary(.pdf). - Mizuta, T., Kudo, I., Kobayashi, Y., A Portfolio of Japanese Equities Weighted by YKS Patent Values, SSRN Working Paper, 2009. - 進化経済学会 名古屋大会, 3/16-17, 2019, 名古屋. - 人工知能学会 金融情報学研究会, 10/20, 2018, 東京, 水平株式保有するパッシブファンドの増加が企業間競争と市場価格へ与える影響--人工市場によるシミュレーション分析--, 本文(.pdf), slide(.pdf). - 日本金融・証券計量・工学学会大会, 8/24-25, 2018, 東京. - 人工知能学会全国大会, 6/5-8, 2018, 鹿児島, 水平株式保有するパッシブファンドの増加が企業間競争と市場価格へ与える影響--人工市場によるシミュレーション分析--. - 進化経済学会 九州大会, 3/29-30, 2018, 福岡. - 人工知能学会 金融情報学研究会, 10/14, 2017, 東京, 忍耐強い(Patient)アクティブ投資は 市場を効率的にするのか？---人工市場によるシミュレーション分析---, 本文(.pdf), slide(.pdf). - 日本金融・証券計量・工学学会大会, 7/28-29, 2017, 東京. - 人工知能学会 金融情報学研究会, 3/10, 2017, 東京, 人工市場シミュレーションを用いたバッチオークションの分析, slideshare, slide(.pdf), 本文(.pdf). - 人工知能学会 金融情報学研究会, 3/10, 2017, 東京, 人工市場シミュレーションを用いたレバレッジドETFが原資産価格変動に与える影響分析(第２著者で登壇), slideshare, slide(.pdf), 本文(.pdf). - 日本金融・証券計量・工学学会大会, 2/17-18, 2017, 東京. - 日本金融・証券計量・工学学会大会, 8/8-9, 2016, 東京. - 日本金融・証券計量・工学学会大会, 1/24-25, 2016, 東京. - 日本金融・証券計量・工学学会大会, 8/7-8, 2015, 東京. - 日本金融・証券計量・工学学会大会, 1/23-24, 2015, 東京. - 人工知能学会 金融情報学研究会, 1/22, 2014, 東京, ダーク・プールは金融市場を安定化しマーケット・インパクトを低減させるか？〜人工市場シミュレーションを用いた検証〜. - 日本金融・証券計量・工学学会大会, 1/10-11, 2014, 東京. - 日本金融・証券計量・工学学会大会, 1/25-26, 2013, 東京. - 行動経済学会, 12/8-9, 2012, 東京, 金融危機を誘発する学習過程を実装した人工市場における値幅制限と空売り規制の分析. - 人工知能学会ファイナンス研究会, 11/17, 2012, 神奈川, 人工市場を用いた値幅制限・空売り規制・アップティックルールの検証. - 人工知能学会全国大会, 6/12-15, 2012, 山口, 人工市場における学習プロセスの必要性検証. - 人工知能学会ファイナンス研究会, 1/28, 2012, 東京, 市場暴落後の反発時における投資家の振る舞いと人工市場への示唆. - 行動経済学会, 12/10-11, 2011, 兵庫, 株式市場急落後の反発に関する分析 −シミュレーション研究との比較−. - 日本金融・証券計量・工学学会大会, 10/14-15, 2011, 東京. - 人工知能学会ファイナンス研究会, 10/1, 2011, 東京, 株式市場急落後の反発に関する分析 〜シミュレーション研究との比較〜. - 人工知能学会ファイナンス研究会, 1/23, 2010, 東京, 取引所の高速化について. - 日本金融・証券計量・工学学会大会, 12/23-24, 2009, 東京. - 日本金融・証券計量・工学学会大会, 7/29-30, 2009, 東京. - 人工知能学会ファイナンス研究会, 1/25, 2009, 東京, なぜ株価学習モデルは似たような銘柄を選んでしまうのか？. - 人工知能学会ファイナンス研究会, 9/13, 2008, 東京, 実市場データをもとにポートフォリオ運用を行うエージェントを用いた人工市場による株価予測. - 情報処理学会数理モデルと問題解決研究会, 5/16, 2008, 京都. - 人工知能学会知識ベースシステム研究会, 3/28-29, 2008, 東京. - 日本天文学会年会, 3/22-24, 2004, 名古屋. - ２００２年プラズマ科学のフロンティア研究会, 10/9-11, 2002, 岐阜, プラズマ波動による新しい非統計的加速, ポスター(.pdf). - 地球惑星科学関連２００２年合同学会, 5/27-31, 2002, 東京. - 地球電磁気・地球惑星圏学会総会, 11/22-25, 2001, 福岡. - ＳＴＥシミュレーション研究会, 10/22-23, 2001, 福井. - 地球惑星科学関連２００１年合同学会, 6/4-8, 2001, 東京. - SGEPSS波動分科会・福井勉強会, 3/19, 2001, 福井. - 地球電磁気・地球惑星圏学会総会, 11/20-22, 2000, 東京. - 「金融情報学：ファイナンスにおける人工知能応用」（共著）, 人工知能学会誌 Vol. 32 No. 6 (2017年11月号) , 905 - 910, 人工知能学会, 2017. - 「41 レバレッジ型ＥＴＦ 市場変動を増幅させる仕組み」, 週刊エコノミスト 2015年11月3日特大号, 毎日新聞出版, 2015. - 「10．自律のための『就職支援』をおこなう若者就職支援協会」(共著), ミッションから見たNPO, 文眞堂, 2012. - 「金融市場における最新情報技術：1. 金融の役割と情報化の進展 -市場の高速化と課題-」, 情報処理53巻9号, 892 - 897, 情報処理学会, 2012. - 「躍動する太陽」, 穹+(きゅうぷらす)， No.6,ヤマギワ発刊, 2001. - 良いアクティブ運用とは？ -対ベンチマーク運用の衰退とハイリーアクティブ運用の再起-, スパークス・アセット・マネジメント, 2016. - 横浜国立大学： 金融市場構造論, 1/23, 2019, 人工市場シミュレーションを用いた金融市場の制度・規制の議論(ゲスト講師), slide(.pdf). - 京都大学公共政策大学院： 金融資本市場論, 1/22, 2019, テクノロジーの進化と金融資本市場 資産運用業界における人工知能と人工市場シミュレーションを用いた金融市場の制度の議論(ゲスト講師), slide(.pdf). - 東京大学公共政策大学院： 経済物理学, 6/23, 2018, 金融ビッグデータと人工知能III 人工市場による市場制度の設計. - 東京大学大学院工学系研究科システム創成学専攻： 金融レジリエンス情報学, 4/19, 2018, 人工市場を用いた金融市場の制度・規制の設計(ゲスト講師). - 東京大学公共政策大学院： 経済物理学, 8/4, 2017, 金融ビッグデータと人工知能III 人工市場による市場制度の設計. - 東京大学大学院工学系研究科システム創成学専攻： 金融レジリエンス情報学, 4/6, 2017, 人工市場を用いた金融市場の制度・規制の設計(ゲスト講師). - 東京大学工学部システム創成学科： 金融市場の数理と情報, 10/19, 2016, 人工市場を用いた金融市場の制度・規制の設計(ゲスト講師). - 東京大学工学部システム創成学科： 金融市場の数理と情報, 10/5, 2016, 金融の役割と機関投資家の株式投資実務(ゲスト講師), slideshare, slide(.pdf), 補足資料(その会社はいくらなのか？)slideshare, 補足資料slide(.pdf). - 東京大学公共政策大学院： 経済物理学, 8/5, 2016, 金融ビッグデータと人工知能III 人工市場による市場制度の設計. - 東京大学大学院工学系研究科システム創成学専攻： 金融レジリエンス情報学, 4/7, 2016, 金融の役割と機関投資家の株式投資実務(ゲスト講師). - 東京大学工学部システム創成学科： 金融市場の数理と情報, 10/7, 2015, 金融の役割と機関投資家の株式投資実務(ゲスト講師). - 東京大学公共政策大学院： 経済物理学, 7/28, 2015, 金融ビッグデータと人工知能III 人工市場による市場制度の設計. - 東京大学大学院工学系研究科システム創成学専攻： 金融レジリエンス情報学, 12/18, 2014, 人工市場を用いた金融市場の制度・規制の設計(ゲスト講師). - 東京大学大学院工学系研究科システム創成学専攻： 金融レジリエンス情報学, 10/9, 2014, 金融の役割と機関投資家の株式投資実務(ゲスト講師). - 東京大学公共政策大学院： 経済物理学, 7/25, 2014, 金融ビッグデータと人工知能III 人工市場による市場制度の設計. - 東京大学大学院工学系研究科システム創成学専攻： 金融レジリエンス情報学, 12/12, 2013, 人工市場を用いた金融市場の制度・規制の設計(ゲスト講師). - 東京大学大学院工学系研究科システム創成学専攻： 金融レジリエンス情報学, 10/10, 2013, 金融の役割と機関投資家の株式投資実務(ゲスト講師). - 日本マーケティング・サイエンス学会 部会 マーケティングの計算社会科学, 11/22, 2018, 東京, エージェント・ベースド・モデルを用いた金融市場の制度・規制の議論, slide(.pdf). - 早稲田大学ビジネス情報アカデミー ファンドマネジメント講座, AI・フィンテック最新事情〜ビッグデータ＆トレーディング編 , 9/4, 2018, 東京, Session 2 金融市場で応用されるAI. - 東京都中小企業診断士協会 中央支部 AI・人工知能研究会, 8/30, 2018, 東京, 人工知能の可能性と限界, slide(.pdf). - 日本テクニカルアナリスト協会 証券投資セミナー, 8/3, 2018, 東京, 資産運用業界が期待する人工知能 〜最新の研究も加えて〜, slide(.pdf). - 日本CFA協会, 6/14, 2018, 東京, 資産運用業界が期待する人工知能 〜業務の効率化と公正な市場の構築〜. - 東京都中小企業診断士協会 中央支部 AI・人工知能研究会, 3/24, 2018, 東京, 人工知能の可能性と限界. - 早稲田大学ビジネス情報アカデミー ファンドマネジメント講座, AI・フィンテック最新事情〜ビッグデータ＆トレーディング編, 3/8, 2018, 東京, Session 2 金融市場で応用されるAI. - トーマツ金融セミナー オルタナティブ投資におけるオポチュニティとチャレンジ, 1/18, 2018, 東京, 運用業界が期待する人工知能. - 東京都中小企業診断士協会 コンピュータ研究会, 9/19, 2017, 東京, 金融業会(特に証券業界)が期待する人工知能. - 早稲田大学ビジネス情報アカデミー ファンドマネジメント講座, AI・フィンテック最新事情〜ビッグデータ活用編, 9/7, 2017, 東京, Session 4 金融市場で応用されるAI／総括と今後の展望(共同講演). - 日本テクニカルアナリスト協会 証券投資セミナー, 8/18, 2017, 東京, 資産運用業界が期待する人工知能(AI)〜テクニカル分析の活用も踏まえて〜. - FIX委員会メンバーセミナー, 6/21, 2017, 東京, 人工市場を用いた金融市場の制度・規制の議論. - 中央大学経済研究所 経済政策研究部会 公開研究会, 6/14, 2017, 東京, 人工市場を用いた金融市場の制度・規制の議論. - MPTフォーラム, 5/11, 2017, 東京, 資産運用業界が期待する人工知能 〜調査活動の効率化と市場をより公正な場へ〜. - 日本銀行 決済機構局・金融市場局合同コンファレンス「AIと金融サービス・金融市場」, 4/13, 2017, AIと金融市場へのインパクト（パネリスト）. - 第18回日本国際金融システムフォーラム2017, 2/28, 2017, 金融市場とAI (人工知能）活用（パネリスト）, 原稿(ブログ形式), スライド＆原稿(slideshare), スライド＆原稿(.pdf), 英語版スライド(slideshare), 英語版スライド(.pdf). - ACM SIGMOD 日本支部 第26回先端的データベースとWeb技術動向講演会(ACM SIGMOD 日本支部第63回支部大会), 10/29, 2016, 東京, 証券取引所の高速化にともなう情報技術の導入. - 東京都中小企業診断士協会城北支部 産学官連携研究会, 6/14, 2014, 東京, 東京証券取引所と東京大学（工学系）の共同研究事例の紹介. - 東京大学： 第３回 オープンゼミ(金融実務者による講演), 1/16, 2013, 東京, 最先端の金融技術と社会的意義. - 日本中小企業・ベンチャービジネスコンソーシアム：第30回定例部会, 11/10, 2012, 東京, NPO法人若者就職支援協会の活動事例報告(共同講演). - 宝印刷，野村総合研究所： e-Disclosureセミナー 〜機関投資家に対する効果的なIR活動について〜, 12/20-22, 2011, 1/27, 2012, 東京・大阪・名古屋, 機関投資家の実務. - 明治大学リバティアカデミー： NPO法人の経営学, 12/6, 2011, 6/26, 2012, 6/25, 2013, 東京, 監事業務について. - CapitalIQ, Northfield： 第７回クオンツ・ネットワークフォーラム, 4/21, 2011, 東京, 人工知能を用いたファイナンス研究の現状紹介 〜特に社会シミュレーションを中心として〜. - 東京大学： オープンゼミ(金融実務者による講演), 2/21, 2011, 東京, 理数工系出身者が求められる金融の世界 〜 人工知能技術を中心に 〜. - SBIジャパンネクスト証券,トムソン・ロイター： 第３回証券特別セミナー＜PTS清算照合と市場最新動向＞, 8/5, 2010, 東京, 日本のバイサイドにおける最良執行環境. - アイフィスジャパン, 工藤一郎国際特許事務所： 経営者向け企業価値向上セミナー, 3/17, 2010, 東京, 無形資産評価と株式投資. - 工藤一郎国際特許事務所： ＹＫＳセミナー, 10/23, 2009, 東京, ＹＫＳ手法を用いた新しい株式投資手法. - 人工知能学会ファイナンス研究会, 9/12, 2009, 東京. - 知財情報＆戦略システム第１５号, Intellectual Investment 知財投資. - 週刊ダイヤモンド, 2019/3/22, 株価暴落、円急騰…過去の「相場経験則」はもう通用しない . - 日本経済新聞, 2019/2/4, マネー底流潮流, 高速取引は「生かさず殺さず」市場の設計、道半ば. - 日経ヴェリタス, 2018/5/27, ここが変だよ 日本株 脱・万年割安へ ３つの処方箋. - NIKKEI STYLE マネー研究所, 2018/1/3, アクティブ型の「真偽」を判別 新指標で投信選び. - 日本経済新聞, 2015/2/27朝刊, 株式の私設取引、売買シェア低下 東証の刻み値縮小が響く 差別化難しく投資家離れ. - 週刊ダイヤモンド, 2014/9/16, 東証の心臓部に潜む 個人を狙う“猛獣”の正体. - 日経ヴェリタス, 2010/9/5, 金融市場を科学する（上）投資家の直感 物理学で読み解く. - 思想哲学研究会（中小企業診断士協会東京支部中央支会）, 1/25, 2015, 「効率的市場仮説という不毛な議論」. - 思想哲学研究会（中小企業診断士協会東京支部中央支会）, 9/1, 2013, 「カネとは何か」. - 思想哲学研究会（中小企業診断士協会東京支部中央支会）, 8/26, 2012, "いま"の知の巨人たち. - 思想哲学研究会（中小企業診断士協会東京支部中央支会）, 7/31, 2011, カール・ポパー. - 思想哲学研究会（中小企業診断士協会東京支部中央支会）, 2/20, 2011, カール・ロジャーズ. - コンピュータ研究会（中小企業診断士協会東京支部）, 8/16, 2010, 資産運用業界の紹介. - 思想哲学研究会（中小企業診断士協会東京支部中央支会）, 6/27, 2010, 投機家ジョージ・ソロスと哲学. - TokyoＲ, 4/24, 2010, Value at Riskの紹介.